Oh Really: GOP is the New Black? It was a year ago that a very controversial billboard went up in Houston that said, 'G.O.P. is the New Black'. The billboard was sponsored by a website called The Raging Elephants. According to the group's web site, they are dedicated to advancing the cause of the conservative and libertarian point of view. Since the erection of the 'G.O.P. 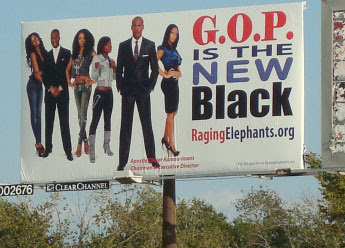 is the New Black' billboard, the group has continued your campaign of trying to attract voters of color to the Republican Party. Their latest billboard to go up featured an image of Martin Luther King Jr. declaring that he was a Republican. Now, if the founder of the group was trying to get attention with these billboards he definitely succeeded. I'm all for African Americans exploring all their options when it comes to the political arena, but I do have a problem with something being called the 'New Black'. If the G.O.P. is the 'New Black' then what in the world is the 'Old Black'? House Niggas are the new black, Ya right.